I had the mistaken impression that other relatives had already done all the research on these two families. 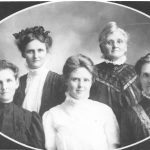 As it turns out, the other researchers had indeed built fairly complete family trees, but I’ve been able to track down some good stories these past several weeks. Here’s a wrap-up. 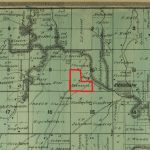 Before we get going with the “epilogue”, I wanted to first share some excerpts from Louis Hanson’s Homestead Application which I received from the National Archives today. It allows us to fine-tune the timeline on Louis’ and Lisa Stina’s migration from Illinois to Kansas. Although Edward had made a life for himself in Saunders County, Nebraska, he still maintained close contact with his family back in Kansas. Here’s an interesting fact: to get from Ceresco to Randolph, you go south on Highway 77 and stay on it for 130 miles. That’s all there is to it! 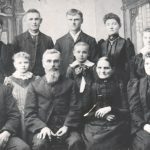 By 1885, the Hultman and Hanson families were reunited once again, living on farms near Randolph in Riley County, Kansas. The Hultmans were in Swede Creek Township and the Hansons were in Jackson Township, their farms separated by only a few miles. As Louis and Lisa Stina settled into their new home in Kansas, Lisa Stina’s parent Jonas and Anna Hultman remained in Illinois with their young children. 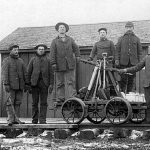 In this post, we’ll follow both of these families from 1865 to about 1890.